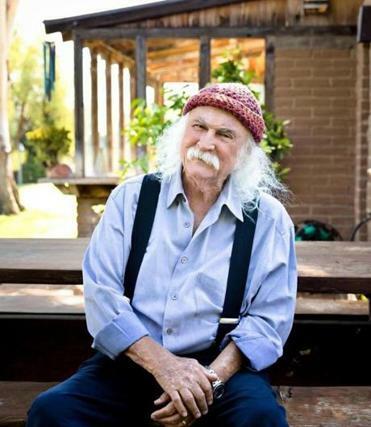 David Crosby has a fantastic laugh. It’s a literal “hee hee hee!” A tittering, almost cartoonish giggle, guaranteed to make his listener grin, coming so unexpectedly from this old salt of a rocker. He laughed a lot in our recent phone interview, the tone for which was set early. “Buddha on the hill/smiling/here if you listen” he sings on his new album — and it’s a vibe he gives off, though this particular Buddha might have a guitar in one hand, a joint in the other. The professional free spirit and his thirtysomething bandmates play the penultimate show of their fall tour in New Bedford Friday night. We caught up with the two-time Rock and Roll Hall of Fame inductee for a wide-ranging interview. Q. Last time we talked, I asked you what new bands you liked, and you told me you had just discovered Snarky Puppy. A. It was a fascinating thing. A friend turned me on to their music, and I loved it. I loved Michael League’s compositions. I loved the joy. I started tweeting about them. I do that — I talk about new musicians I find. [League] found out about it, we exchanged messages. He’s a tremendous musician. He introduced me to Becca and Michelle. I realized there was a chemistry there, between the four of us. We wrote and sang [the new album] together. And I’m stunned at how it came out. It’s an amazing chemistry, it was fast and fiery and unbelievably joyous. It was like a bunch of kids jumping into a pile of leaves. Q. In a press release you said: “If leaving a group like Crosby, Stills & Nash was like jumping off a cliff, then finding the Lighthouse Band was like growing wings halfway down.” What do you mean by that? A. Leaving a big group [was tough but something] I had to do. It had devolved to the point of: play the hits with no joy. We didn’t like each other. Career-wise, it’s a disaster to leave a [popular] group like that — it was like diving off a cliff. So it’s amazing what happened, having these people in my life. Doing this work is such a joy, man. It’s such an affirmation of everything I believe in. Q. So you like working in a group better than solo? A. I do. I always like working with other people better than by myself. I like the spark between people. Q. You’re a big tweeter. A. I love to communicate with people. People are fascinating. I don’t like the trolls and bots and the ‘[expletive] you!’ But the best thing about Twitter is you just delete them. I delete four or five people a day. Q. What’s your take on the political state of things right now? A. Terrible, terrible, terrible, terrible. The real problem is we’re not addressing global warming. Q. People say there are no protest songs anymore. A. There are. But most people in the music business are trying to be in the pop end, where you make money. There are no protest songs there. It’s fallen mostly on singer-songwriters who are descended from troubadours. Q. Do you think CSNY will ever tour again? A. Hmm, my answer is always never say never. But it’s up to Neil [Young]. Q. How are things between you two? A. I haven’t spoken to him for a long time. I’d happily work with him. He’s a challenging guy. He pushes the envelope all the time. I like that. Q. How’s Joni [Mitchell] doing [after suffering a brain aneurysm in 2015]? A. I had dinner with her a couple months ago. It’s a hard, uphill battle. She’s fighting it. She’s a strong woman. Q. I love that you guys cover her “Woodstock” on the new album. What made you decide to add that one? A. The first time we sang it live, they started applauding in the middle of the song. It’s become a favorite of ours. Q. You have your own brand of pot coming out? A. [Laughs] I’m going to! I’m trying to make a deal with someone. Willie [Nelson] and Snoop have [their own brands]. You have to understand, the numbers are in for Colorado and Oregon, and others states are looking saying, “Hmmm.” It will be legal everywhere. No question. Anheuser-Busch is trying to sell. It will be legal. You can be damn sure. Q. Have you tried Willie or Snoop’s pot? A. [Laughs for a long time] Girl! [Laughs] I’ve smoked for 50 years. I’ve tried ’em all. [Laughs] Willie, Snoop — neither of those guys would try to sell you bad weed. I took 14 years off from smoking — doing nothing for 14 years — then I started smoking pot to go to sleep. I like a joint in the evening. I play guitar and fall asleep. .com. Follow her on Twitter @LaurenDaley1.